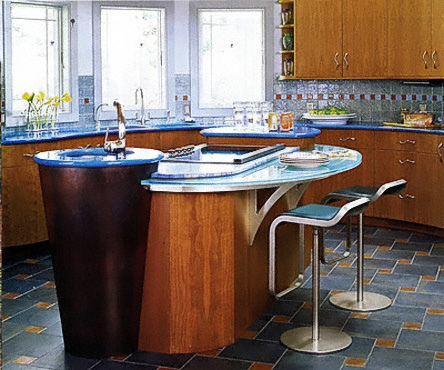 Blue granite is known for its durability, quality, and minimal maintenance needs. Granite is also heat resistant which makes it a great material for countertops. Aqua Kitchen and Bath is a one-stop-shop for all the residences in Wayne, North Caldwell, and Franklin Lakes who want to find beautifully luxurious granite countertops. Our granite yard has over a thousand options to choose from with many colors to suit your needs. At Aqua Kitchen and Bath, customization and installation are a breeze. Our employees are highly trained to cut and install granite. Aqua Kitchen and Bath offers the highest quality blue granite. Some of our high-end options include Blue Pearl granite, Polar Blue granite and Blue Bahia granite. Once installed, these beautiful blue granite countertops will add value and convenience for years to come. With these high-quality options, Aqua Kitchen and Bath is your best source for home improvement. This stone is considered one of the most beautiful. 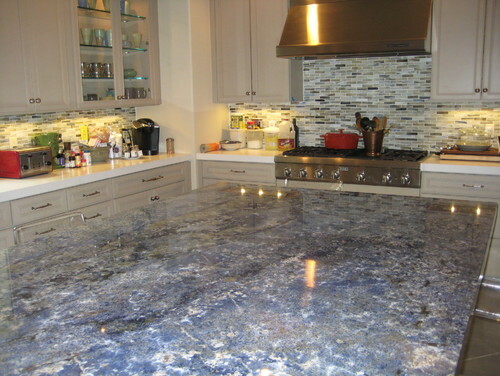 Blue Pearl Granite is said to be a non-traditional blue with touches of pearl and silver. The deposits of silver give this granite a metallic look. It makes a great addition to any kitchen or bathroom by giving your home an upgraded look with a minimal amount of maintenance. 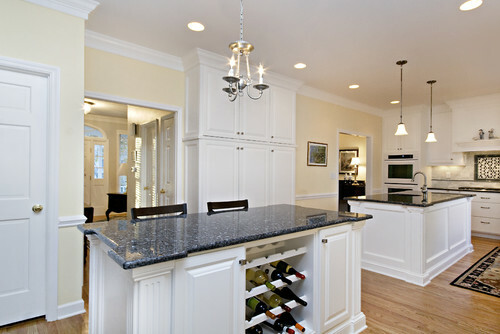 This particular granite can go with most color schemes, though it looks best with whites. This tone will ensure that your kitchen will be looking the best it can and give you the utility of granite for years to come. Polar Blue granite is also known as Volga Blue granite. This stone represents a navy blue color with specks of lighter blue and gray. From afar, it looks almost black. This granite can appear pearlescent. Pearlescent means that it can display a large array of colors. This development is caused by dense mineral deposits in the granite. To some, this beautiful stone could be too dark. However, its beautiful color will make sure that your kitchen or bathroom will stand out above all others. Polar Blue granite, even with its darker tones, can still go with any color scheme that you may have planned for your kitchen. Blue Bahia is one of the most popular because of its beauty. This granite is the lightest colored one you can find on the market. Its marbling ranges from sky blue to navy with specks of brown and white. Blue Bahia is unique in the fact that its look changes under different lighting. This earthly beauty is why people are happy to pay the Blue Bahia granite price. Most people love the look of Blue Bahia. The Blue Bahia granite price means paying for the beauty and all the benefits of granite, such as heat resistance and minimal maintenance. You will be getting the best product for your money. Blue Bahia goes with most color schemes making it an easy switch from your old countertops. The Blue Bahia granite price is well worth the look and quality you will be giving your new kitchen. Remodeling your kitchen or bathroom can be a hassle. However, Aqua Kitchen and Bath can eliminate some of the stress. We have a large selection of granite that can offer you the style and color you want. You will not be let down by their high-quality selection of blue granite. Aqua Kitchen and Bath carry the most popular selections such as Blue Pearl Granite, Polar Blue granite, and Bahia Granite. We can help you with all of your tile and countertop renovations. Experienced workers will ensure that your customization and installation process goes smoothly. Aqua Bath and Kitchen is here for your renovation needs. Feel free to stop by the store or call for an estimate.